Find out what this celebrity hunk is like behind the camera, as we give you exclusive access to what goes on in a regular Sunday for this TV5 actor. Ever wonder what celebrities do on a daily basis? Sure you know they spend so many hours (even days) on the set shooting scenes for their shows. But aside from the actual scenes you see on TV, do you wonder what they do in between takes? Or when they’re not on call? So, as our special treat for you this December, our Celebrity Month, we're treating you to much-awaited "A Day In The Life Of" features, starting with one of the hottest hunks we have in the country today, 2008 Cosmo Centerfold Jon Avila. 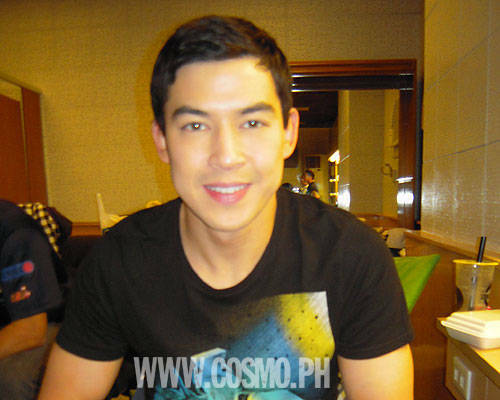 This Filipino-British cutie captured the hearts of many Filipinas as a television heartthrob. We've all had a crush on Jon Avila for the longest time, since we saw him on our TV screens and magazine spreads. In 2007, he appeared as a housemate in Pinoy Big Brother Celebrity Edition 2. We also saw him co-host the Lucy Torres-Gomez-hosted dance show on TV5, Shall We Dance. He’ll be hitting the big screen soon in the upcoming Metro Manila Film Festival, where he's part of the cast of two MMFF entries: Bulong and Ang Tanging Ina Mo Rin (Last Na 'To). The day Cosmo tailed TV5 hunk Jon was on a typical Sunday, when he went to the live coverage of TV5’s variety show, PO5. He arrived at Broadway Centrum along Aurora Boulevard at around 10 in the morning and welcomed us with a big smile, holding two cups of healthy fruit shakes for breakfast. Jon shared that, even on days when he doesn't have work, he usually wakes up at 10AM so he can hit Gold’s Gym for boxing by 11AM. He first led us to his dressing room, which he shared with other male PO5 stars. Inside, we had a little chat about what happens inside the PO5 dressing room and other stuff about his work. He shares that everyone in the dressing room are “makulit,” especially Mr. Fu and IC Mendoza, who always joke around with Jon. After all the backstage chit-chat, the music-lover--who recently bought himself a professional DJ set and plans to go on gigs next year--took a power nap to get him energized for the show. We're quite sure he got recharged, as he was full of energy onstage, particularly when he danced along with the Shall We Dance crew and modeled for a fashion show segment for Lucy Torres-Gomez’s birthday special. After the live broadcast of PO5, Cosmo continued our chat with Jon. His friend Andrew Wolff was there to help him "answer your hard questions," they said. Read on to get to know more about Jon in our short Q&A below. Then, click through our gallery to see our snapshots of Jon's activities (we're giving you an exclusive peek inside his car, too!). Watch for the video, which we'll post soon, where Jon will take you through his day himself. I normally wake up at around 10AM. I open my laptop, where I check the news, current affairs, and update my Twitter. Then I make coffee and hit the shower. When I don’t have work, I go to Gold’s Gym and do boxing. Aside from work, what else do you do on a regular day? I like to follow a routine. So I do boxing at 11, then... What else? Then just about anything. I love music. I recently bought a professional DJ set. Are you planning on having gigs anytime soon? All Stars Dance Studio in Wilson, 'cause most of my friends are there. What would you like to do more often but don't always have the time for it? I’d like to travel more in Asia, like in Japan. You were part of Shall We Dance, right? Have you always been fond of dancing? I like to watch people dancing (laughs). How do you spend your “me” time? I like to get a massage. Or I go shopping--There’s nothing wrong when I say shopping, right? (Looks at Andrew Wolff). In Trinoma. You’ll always see me there. Which stores do you go to? Of course, Bench. And also Landmark. What look or style do you usually go for when you shop? Can you describe your personal style? I like street chic style, or hip-hop trends. I also mix designer with hip-hop brands. Launch the gallery to see photos of a regular Sunday for Jon, and watch for our video coverage on CosmoTV!